Hello, it’s the anonymous PhD again, back to report what the wisdom of the crowd was on our wedding-planning dilemma. First, I’d like to thank Dan’s readers for your excellent comments. Matt and I really appreciate your thoughtfulness. Have one of Matt’s bothers stand on my side, and the other on his side. Have no attendants, but give Matt’s brothers some other role of honor, such as giving toasts or readings. Have only groomsmen, and I should not worry what people infer about me. Now it’s time to let you in on why I was asking for wedding advice on a blog about rationality and decision making. One motivation was that Dan and I were curious whether Matt’s “wanting” attendants carried more weight than my “not wanting” them. Many people (55%) said they simply chose the option they themselves prefer, or based on considerations of what is normal/typical (33%) or costly/effortful (31%). But, some (28%) did say that “wanting” is more important than “not wanting”. While I understand that feeling, I can’t figure out if it’s rational. What do you think? Dan and I also wondered what people’s answers reveal about how they think people should resolve impasses like this. By far, the most common principle mentioned was that people in a relationship should take turns getting their way when it comes to big impasses. So, in our case, the idea was that since I conceded to Matt’s desire to have a big wedding, he should in turn concede to my desire not to have attendants. People should not take turns getting their preferred outcome – scorekeeping and adversarial thinking are hurtful (though, an alternative method was not explicitly suggested). 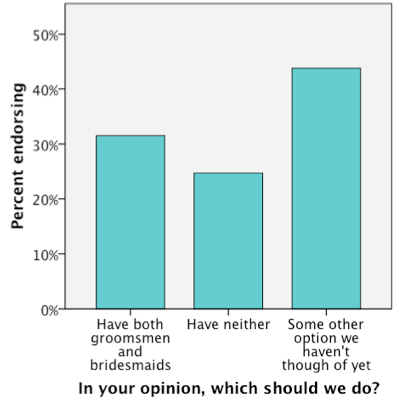 “Halfway” compromises (in this case, for example, a big wedding but no attendants) leave everyone unhappy – a couple should go all the way with one person’s preferences in a given situation. Personally, one principle that stuck with me (and Matt, too) was brought up by the first commenter, Francesca: that what both of us should be doing is asking, “What will make this wedding great for the other person?” rather than concerning ourselves with our own interests. I thought this was very wise advice. For those who are interested, we have ultimately decided to have my three sisters stand up as bridesmaids, and my brother, along with Matt’s brothers, stand up as groomsmen. Having just siblings as attendants avoids the political intricacies of picking friends, and Matt has offered to pay for the bridesmaids’ dresses (since my sisters are broke college students) as well as coordinate the fittings. My siblings are much more tradition-minded than I am, and they’re excited to be a part of the wedding.